Hearing about Grace’s art hanging in the president’s study triggered some memories of my own. I had been beyond thrilled when I learned Hillary Clinton had hung my portrait of Chelsea in her private study when she was first lady. It saddened me Grace wasn’t here to know of the honor bestowed upon her painting. I was drawn to Grace and began reading articles about her short life. We had so much in common. Like me, she was born with the soul of an artist. When she grew up, she wanted to live on Martha’s Vineyard. Vacationing there every summer for years, I share her love for everything about that island. And I learned that, like me, some of her happiest moments were spent there. I felt such a connection to Grace. 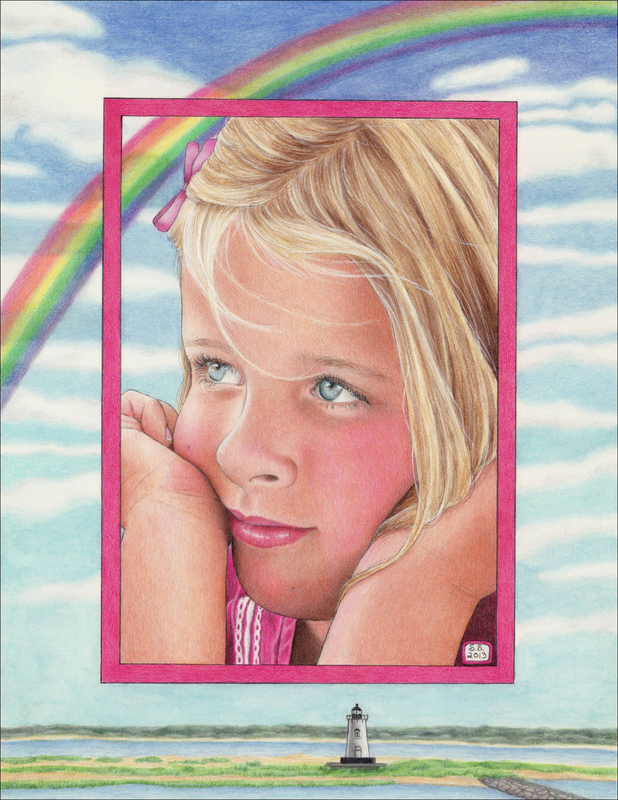 The thought began coming to me that I had to paint a portrait of her for her parents. I tried to dismiss it as just a sympathetic impulse, but the entreaty wouldn’t leave me alone. I had the distinct feeling it was something Grace wanted me to do. It was my part to play in her family’s healing. The painting would be a gift from Grace through me. I tried pushing these thoughts down but they were always there, humming in the background. Finally, I surrendered to them and tracked down her mom, Lynn. Understanding she might be wary, I expressed my conviction with trepidation. Grief is such a personal thing. I didn’t want to add to her parent’s burden in any way. Lynn accepted my offer and sent me the program from Grace’s memorial service. When I opened it up, I knew I had found the picture to base her portrait on. Inside the booklet was a photo of Grace taken by her mother at the Martha’s Vineyard Agricultural Fair. The pensiveness in that child’s beautiful eyes revealed her soul – a look only a mother could capture. Last week, I put the finishing touches on my painting of Grace. All that’s left to do is pack it up and ship it to her family. My hope is that anyone who reads this post prays for Grace, and for the healing of all those she left behind. Collective prayer always brings miracles. Grace Audrey McDonnell didn’t have an ounce of hate in her. She was the light and the love of her family. She was Chris and Lynn’s daughter and Jack’s little sister. She was a granddaughter, a friend and loved by many. But to me, she will always be, simply Grace of my heart.